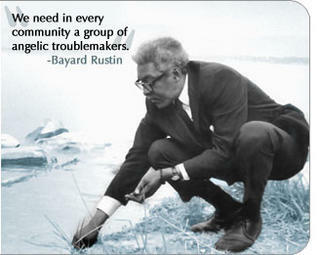 The words of African-American, Queer Civil Rights Leader, Bayard Rustin spoken in 1986, still speak to us today. Great quote. Thanks for this. He had a way of clarifying where the focus should be. A very pro-political view from the normally not-so-political Quaker. (I guess I think of the Quaker cause as social, not political, if that makes sense.) Interesting. Plus, how do you deal with his call to abandon self-denial within a Christian context? It seems Christ calls us to self-denial, but I’m not really sure what that looks like. While it may be true, depending on your definition of “political”, that Quakerism as such is “non-political”, it was certainly never true that Friend Bayard Rustin was non-political. If I am not mistaken, he was the author of a widely-read (and widely-debated) article called “From Protest to Politics” that called for a shift of the civil rights movement from the streets to the voting booth sometime in the 1960’s. Although I haven’t studied his ideas on this in any detail, I don’t see any contradiction between Bayard’s “call to abandon self-denial” and Christian faith. I think the “self-denial” he was talking about and opposing is the denial of the truth about oneself, including the truth that one is loved by God and worthy of love and respect from fellow-humans. The self-denial that Christianity preaches is a different animal: a denial of the self’s supposed right to lift itself up over others and to pursue its own will without regard for God or neighbor. – – Rich Accetta-Evans (Brooklyn Quaker. I look forward to the day when gay and nongay Quakers can join in a full appreciation of American civil liberties as established by four gay Quakers: Susan B. Anthony, Walt Whitman, Alice Paul, and Bayard Rustin. Commenting here from the World Gathering. This morning there was an announcement in the WGYF Daily Bullitin about a meeting this afternoon at 4:30, so the queer population does exist, and contrary to the reply you got from Aiden McCartney (Ireland YM) about doing one of your performances here, you would fit right in. I have observed that many Quakers here are really accepting of others and homosexuality has been brought up in several conversations that I have been in since getting here Tuesday. There is even a gay guy here from Utah. I have had Christians make the argument (an argument I vehemently oppose) that human beings have no rights at all–that we are merely sinners in the hands of an angry God, as it were. Thus, they conclude that all fights for civil rights are wrong, because they are a fight for rights, period, they they do not metaphysically possess. So, yeah–that kind of thinking is out there.